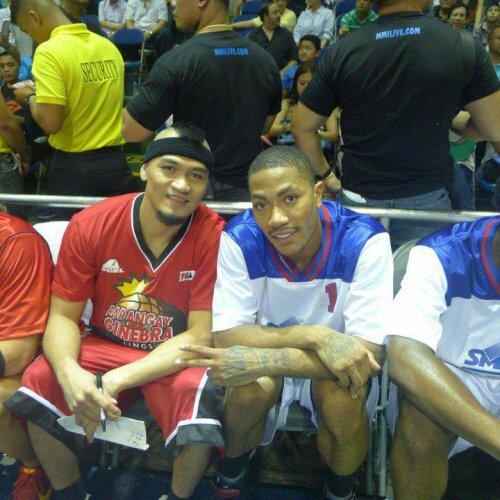 In the above picture we see Mark Caguioa seating beside the Reigning MVP of the NBA, Derrick Rose. For me, he has no reason to be shy to D-Rose because right now he is within striking distance from winning the PBA Season 36 MVP award. He's having one of the best seasons of his life this time just like what D-Rose had in the past NBA Season. I can feel that MC-47 will win the MVP award. Taking a look back at the PBA Fiesta Conference, Mark Caguioa placed second behind Jimmy Alapag for the right to be hailed as the Best Player of The Conference. Mark got more votes from his co-players while Jimmy got more votes from the PBA press corps and from the media. All in all when the votes were tallied Jimmy Alapag was the one who got more votes. Thus, he won the Best Player of The Conference Award. But when we take a look at their averages last Fiesta Conference, in terms of points scored, rebounds, and assists, they were not that far from each other. Mark averaged 14.95 points, 5.5 rebounds, and 2.45 assists per game while Jimmy had 13.8 points, 3.15 rebounds and 5.6 assists per game. It's just that Jimmy had more votes. Mark Caguioa really needs to have a great Governor's Cup if he wants to beat Jimmy Alapag in getting the PBA Season 36 MVP Award. In other words, he needs a big break that will convince the whole PBA world that he should be the MVP. That big break that Mark needs is happening right now in the season ending Governors' Cup. We are witnessing the old Caguioa that we used to see during the late 90's. His patented pull up jumpers and dare devil floaters are back. In fact, he's currently averaging 23 points and 5 rebounds per game. He has led his team in winning back-to-back games these past 2 weeks against Rain or Shine and against B-Meg. He's leading the charge for Ginebra in the semi-finals. Due to those sterling performances, the Accel-PBA Press Corps named him as the PBA Best Player of the Week for two consecutive weeks, July 4-10 and July 18-24. That means a lot to MC-47's MVP Campaign because back in the Fiesta Conference, the Accel PBA Press Corps voted for Jimmy Alapag and now they seem to want MC-47 more. MC-47 is on his way to getting his first MVP award. No one can stop him from getting it. "You would always want a player like Caguioa, who will always battle, compete. It doesn’t matter what the odds are, kahit me dinaramdam sa katawan niya. Kung kaya niya ilalaban niya." I bet that we'll see those things later in the second game as Ginebra will go up against their sister team Petron in the PBA Governors' Cup semi-finals.